Two significant fights in Boxing’s Middleweight division take center stage this weekend as both bouts could have an impact on the overall landscape of the division. The first of the two bouts will take place on Friday night at the Santander Arena in Redding, PA as current World Boxing Association (WBA) number one Middleweight contender Daniel Jacobs faces former WBC Jr. Middleweight world champion Sergio Mora in a bout scheduled for twelve rounds that will headline the latest addition of the Premier Boxing Champions series broadcast by Spike TV in the United States. This is a rematch of a fight that took place in August of last year that had a somewhat “Inconclusive” outcome. In what was an exciting fight where both men suffered knockdowns, the combat was halted in the second round when Mora, who was in the process of attempting to evade Jacobs’ offense went down to the canvas with his right leg bent awkwardly and suffered an injury to his right ankle which forced the fight to be stopped. The inconclusive ending to this fight because of the injury suffered by Mora, which was later confirmed to be a fractured ankle has fueled demand for this rematch. For Jacobs, who has held interim/regular champion status in the WBA’s Middleweight ratings for over two years, this will be his first fight since scoring a first round knockout over former WBO Middleweight world champion Peter Quillin in December of last year. Mora has not fought since suffering the injury and subsequent loss to Jacobs last year and it will be interesting to see if Jacobs attempts to press the action from the outset and test Mora or if the rematch will be a more tactical encounter. Although Jacobs has an edge in regard to punching power as he has stopped twenty-eight opponents in his thirty-one career wins and has registered a career knockout percentage of 88%, Mora was able to get to him in the first fight and even though he is known more as a defensive boxer, he has also shown a willingness throughout his career to mix it up with his opposition. In some ways, this fight could be described as a “Do Over” due to how inconclusive the ending of the first fight was. Both men can box and both have shown the willingness to go toe to toe. The question this observer has going into this fight is whether or not this will be a continuation of the first fight where both fighters made their presence known and were able to score knockdowns of each other or if this will be a more tactical fight. Although Mora was able to get to Jacobs in the first fight, it is logical to assume that he will look to outbox Jacobs in the rematch. Mora has the kind of style that uses good lateral movement, ability to slip punches, and also has the hand speed that can frustrate opponents. Jacobs meanwhile should look to cut off the ring from the outset and thus limit Mora’s ability to use movement in order to avoid his offense. Jacobs has the ability to get an opponent out of there with one punch and also wear down an opponent over the course of fight. Even though one cannot discount the possibility of one punch being the deciding factor in any fight, I believe Jacobs should not only look to limit Mora’s movement, but also use body punching as a component of his offense. If this fight does go longer than the first fight between these two men and Mora is able to have success in using his movement to evade Jacobs’ offense, Jacobs could slow that movement down by going to the body of Mora consistently, which will theoretically take a toll on Mora’s legs and ability to move as the fight progresses. This can be of course easier said than done against a slick boxer like Mora. The second of the two Middleweight showdowns that will take place this weekend will be a battle between two undefeated world champions as undefeated WBA/IBO/IBF/WBC Middleweight world champion Gennady Golovkin will attempt to make his seventeenth successful title defense against undefeated IBF Welterweight world champion Kell Brook on Saturday night at the O2 Arena in London, England, which will be broadcast the United States by HBO Sports. In his last title defense in April of this year Golovkin stopped a “Game”, but overmatched Dominic Wade in two rounds in what was his sixteenth successful title defense and his twenty-second consecutive knockout. Since that fight, the Middleweight “Knockout Artist” was named WBC world champion after previously holding interim championship status in the WBC’s Middleweight ratings per his victory over former WBC number one contender Marco Antonio Rubio in a title defense of his unified championship in October 2014. Golovkin was named champion of the WBC following former champion Saul Alvarez’ decision following his knockout win over former Jr. Welterweight world champion Amir Khan in May to seek other opposition rather than face Golovkin in what would have been a mandatory title defense for him and a fight that would of further unified the Middleweight division. Golovkin now owns four of five world championships in the division with Alvarez’ choosing instead to attempt to win a Jr. Middleweight world championship on September 17th when he faces undefeated WBO champion Liam Smith at AT&T Stadium in Dallas, TX in a bout that will headline a pay-per-view card broadcast by HBO Pay-Per-View. In a scenario somewhat similar to Alvarez’ last fight against Amir Khan however, Golovkin will attempt to make his seventeenth successful title defense against current Welterweight world champion Kell Brook. This will be the first time in this observer’s recollection that a current Welterweight world champion will attempt to win a Middleweight world championship since Marlon Starling attempted to win the IBF Middleweight world championship from Michael Nunn on April 14, 1990. Starling, who was then the WBC Welterweight world champion moved up two weight classes to challenge the undefeated Nunn for his world championship. In what was a tactical and non-eventful fight, Nunn retained his Middleweight world championship with a twelve round majority decision over Starling. Now twenty-six years later, Brook will attempt the same feat as he will move up in weight to challenge Golovkin for his unified crown. Although Golovkin holds the WBA Middleweight world championship as part of his unified crown, the WBA has chosen not to sanction this fight for its Middleweight world championship citing both the fact that Brook has never fought in the 160lb. Middleweight division as well as WBA president Gilberto Mendoza calling the fight in comments made to ESPN Deportes quote “A Business fight” stating that it was the organization’s stance that there were opponents in the Middleweight division who were willing to face Golovkin including current number one contender Daniel Jacobs as well as expressing his opinion that Brook could have sought opposition in the 147lb. Welterweight division such as current WBC world champion Danny Garcia to attempt to unify the Welterweight division as the WBA’s reasoning for that sanctioning this fight. This does present a scenario where theoretically the winner of the Jacobs-Mora rematch could be named WBA Middleweight world champion perhaps as soon as next week assuming Brook pulls off what should be considered a significant upset over Golovkin per Jacobs holding interim/regular champion status in the WBA’s Middleweight ratings. The politics of the sport notwithstanding, it is refreshing as an old school Boxing historian and enthusiast to see a fight where there is no element of “Catch Weights” where Brook will be moving up to face the unified Middleweight world champion in that champion’s official weight class and not at a weight “In Between.” It is something that quite frankly the sport needs more of. As for the fight itself, Kell Brook will have the task that all previous Gennady Golovkin opponents have had. Brook must find a way to avoid the constant pressure and seek and destroy attack that has made Golovkin one of the most feared fighters in recent Middleweight history as the champion has registered a career knockout percentage of 91% having knocked out thirty-two of his thirty-five opponents in his professional career. Golovkin is also four successful defenses away from tying the all-time Middleweight record for successful world championship defenses of twenty currently held by Bernard Hopkins. Brook is a boxer/puncher that has shown good hand speed and power throughout his career. The obvious question going into this fight is will Brook’s hand speed and punching power be the offense of weapons they have been in a weight class thirteen pounds below where this fight will take place. As for Brook’s ability to make the 160lb. Middleweight limit, he officially came in one pound heavier than the champion at the official weigh-in on Friday weighing in at 159lbs to the champion’s 158lbs. It will be interesting to see if this will be of any significance once the two fighters have had the opportunity to re-hydrate before they enter the ring. In thinking of how this fight might be fought, I have had thoughts of Golovkin’s title defense against former two-time Middleweight world champion Daniel Geale in July 2014. Much like Brook, Geale is a fighter with good hand speed and lateral movement who has the ability to execute his offense in volume. Geale however, was unable to use his movement to his advantage as Golovkin consistently applied pressure on him before knocking Geale out in the third round while absorbing a flush right hand from Gealeas he threw and landed a counter right hand of his own. 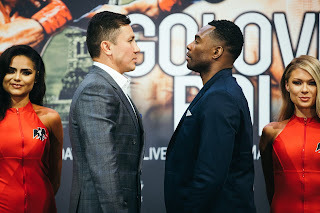 It is logical to assume that Golovkin will look to pressure Brook from the outset in a similar way as he was able to do against Geale and look to test the Welterweight world champion’s ability to take a Middleweight punch. This is a fight where Brook could have some success using his movement and hand speed, but the question will be can he avoid Golovkin’s pressure and power for twelve rounds? Even though Brook is the underdog in this fight, he will likely have the support of the crowd as the bout will take place in his home country of England. Although Brook is undefeated and is a world champion to his credit, it is understandable why he is considered the underdog in this fight against a fighter with not only a 91% career knockout percentage, but also a fighter who has never fought past eight rounds. What these two fights present are two intriguing storylines. The first fight, a rematch between a former world champion and a top contender where the hope is for a clear winner to emerge. The new wrinkle to this rematch however, is also the possibility of the winner potentially becoming a world champion depending on what happens in the second of the two fights taking place over the weekend. A battle between two undefeated world champions where one is moving up significantly in weight to challenge the other for his crown. Whether this fight will be as tactical as Nunn-Starling remains to be seen. If however, Brook can produce an unlikely significant test for a Middleweight champion who has knocked out nearly all of his opposition, this encounter between a current Welterweight world champion and a current Middleweight world champion may prove a historic moment in recent Boxing history. If both fights turn out to be as intriguing as they appear to be on paper, the real winners will be Boxing fans. PBC: Jacobs vs. Mora II takes place tonight (Friday, September 9th at the Santander Arena in Redding, PA. The fight can be seen in the United States by Spike TV at 9PM ET/PT. Check your cable or satellite provider for time and channel in your area. Check your listings internationally. For more information on the Premier Boxing Champions series please visit: www.premierboxingchampions.com. Golovkin vs. Brook takes place tomorrow night (Saturday, September 10th at the O2 Arena in London England. The fight can be seen in the United States on HBO Sports live at 5:30PM ET/PT. The fight will be replayed later in the evening as part of HBO’s live coverage of a double header featuring Carlos Cuadras defending his WBC Jr. Bantamweight world championship against WBC Flyweight world champion Roman Gonzalez and a Jr. Middleweight rematch between Jesus Soto-Karass and Yoshihiro Kamegai taking place at The Forum in Inglewood, CA. This portion of HBO’s Boxing coverage will begin at 10PM ET/PT. Check your cable or satellite provider for time and channel in your area. For more information please visit www.hbo.com/boxing. In the United Kingdom, Golovkin vs. Brook will be televised on pay-per-view on Sky Box Office beginning at 6PM (Local UK Time) for €21.95 HD/€16.95 Standard Definition. For ordering information please visit: https://my.sky.com/orderboxoffice/. Should Golovkin Fight Jacobs Next? What’s Next For Darwin Price?